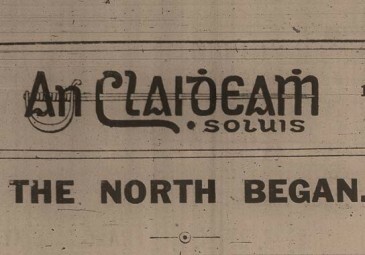 For the first time in its history, papers from the Dublin Diocesan Archives have been made digitally available for scholars, researchers and members of the public. 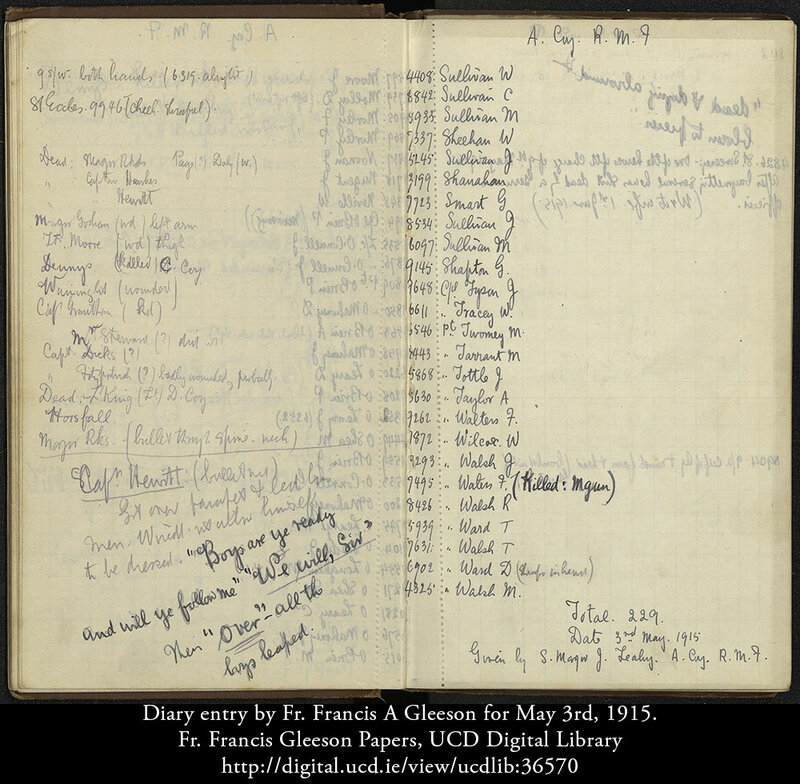 Experts in the Dublin Diocesan Archives and the UCD Digital Library, University College Dublin, have worked together for over 18 months to transcribe and digitize the diaries and papers of Fr Francis Gleeson, a Dublin Diocesan priest who ministered to soldiers in World War One. 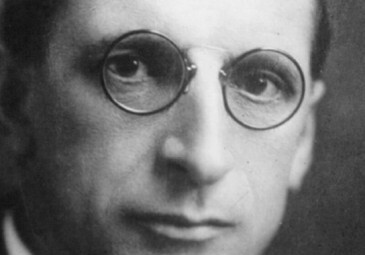 Fr Francis Gleeson was Chaplain to the Royal Munster Fusiliers as they faced battle on the Western Front. 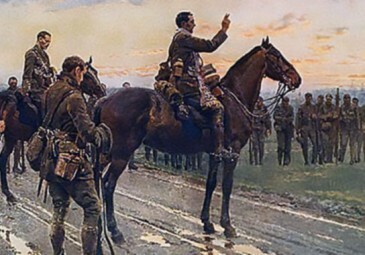 He was the priest depicted in the famous painting, The Last General Absolution of the Munsters at Rue du Bois by Fortunino Matania, where he is seen mounted on a horse, giving absolution to the troops on the eve of the Battle of Aubers Ridge on May 8th, 1915. He kept meticulous handwritten diaries of his time with the Munsters. They contain vivid, emotional and very often tragic accounts of his time with the troops near the battlefield. He was often the only person in a position to communicate with the families of soldiers missing or killed in action. “Boys are ye ready and will ye follow me”. “We will, Sir”. Then “Over” all the boys leaped (entry for May 3rd, 1915). 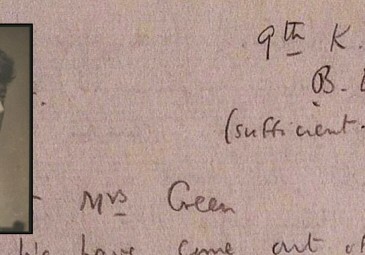 The Fr Gleeson collection consists of diaries, brigade roll books, letters and miscellaneous notes. These were transcribed by the Dublin Diocesan archivist, Noelle Dowling and volunteer archivist, Peter Sobolewski. They began work in January 2014 and finished nine months later. 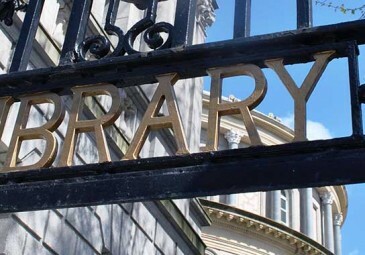 The collection was then given to UCD Digital Library, to start their work in November 2014. The new digitised collection was officially launched by the Archbishop of Dublin, Diarmuid Martin, at a reception in the Holy Cross Diocesan Centre. The event was attended by members of Fr Gleeson’s family and the British Ambassador to Ireland. Since its launch, the collection has garnered great interest in both traditional and social media, with a feature on RTE news and in the Irish Times, and an extensive presence on Twitter. 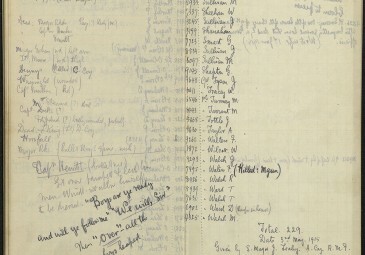 The collection, consisting of Fr Gleeson’s handwritten materials and their transcriptions, is free to view online at http://digital.ucd.ie/view/ucdlib:36570. Image: detail from The Last General Absolution of the Munsters at Rue du Bois by Fortunino Matania (Source: Wikipedia).